Our hero is normally called Princ Valijant in the Balkan area, but in this Kekec magazin our hero is called: ¶puhu Ba^uaht . 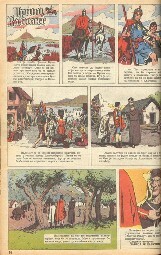 Kekec was a magazine/newspaper comic printed around 1965 in full color. In each issue one page of the Princ was printed. Cyrillic lettering! The issue below is from 30 sept 1965. Publisher is Borba from Beograd.